This project assumes you have read those earlier needle felting projects. It uses many of the same techniques, so if you need more examples, look to the raccoon instructions or the instructions for making a needle felted dog, to help you understand the steps used to make the scale miniature sheep. These sheep also work well for scale farm and dolls house scenes, or they can be made smaller or larger for Christmas Creche or Easter scenes or decorations using the same techniques. Wool and silk roving, felting needles, foam mat and pipe cleaner used to make scale miniature needle felted dogs, raccoons and sheep. Photo copyright 2010 Lesley Shepherd, Licensed to About.com Inc.
Needle felting is an easy technique which uses roving (unspun fiber, usually wool, mohair or silk) to create felt by pushing the needle straight up and down through the fiber. This is a simple way to sculpt small animals like the sheep in these instructions. To needle felt you push a special serrated needle straight up and down in a punching motion through a ball or line of fibers. As you felt, the fibers will pack closer together, so practise is needed in order to create something which is a particular size. Depending on the amount you felt your fibers you can create very small, hard items, or softer, less dense felted sculptures. The technique is easy (and repetitive). You can fix any errors by adding or subtracting fiber from your sculpture. The more you practise, the better you will get at sculpting animals from fiber on a wire frame. Roving or unspun fiber - in white, black, or a brown/white blend. Most yarn stores sell roving for felting, often in silk and wool. Costume suppliers and doll making suppliers usually have mohair roving for dolls hair or actors beards and moustaches. If necessary you can use wool fibers from old sweaters or yarn from knit projects, try to pull it out into loose, straightened clusters before using it for felting. Black or Beige Embroidery Thread - To mark the mouth and nostrils on your sheep's face. If you find this technique difficult, you can use a fine permanent pen instead. Pipe Cleaners - Depending on the size of sheep you are making you will need one or two pipe cleaners. Use thin pipe cleaners for scales smaller than 1:12, and thicker ones for larger scale sheep. Fibers on pipe cleaners make it easier to catch the wool roving as you felt. If you don't have pipe cleaners, use wire, something around 24 gauge should be fine. Needle Felting Mat or Brush- or piece of thick foam to protect the surface you are working on and help keep your needles from breaking. Felting Needles - Medium, fine, and extra fine needles are useful. These are very sharp long needles with notches up the shaft, which pull and mat fibres together. They are available from yarn suppliers who sell felting materials and are also available online. I use sizes 38, 40 and 42 for miniature animals. If you intend to work only with wool, sizes 36, 38 and 40 are also suitable. Sheep Photo - It is far easier to get the shapes and proportions right for a sculpture if you have a photo in front of you. These instructions include some photos of plastic model sheep you can use for reference. Glass Eyes or Beads - I used 1.5mm wire ended black glass teddy bear eyes (not suitable if these sheep will be near young children) You can also sew or glue on suitable beads, or felt eyes in place with black fiber. Sharp Scissors - to trim the sheep's coat to shape. Wire Cutters and Tweezers or Needle Nose Pliers - to cut and bend eye wires and pipe cleaners into shape. To make something the correct scale size to fit with your other projects, you will need to know the measurements of the real object, and the scale ratio you want to work in. I used this plastic ram from Schleich to check the measurements for the 1:24 scale sheep I made. The model has measurements of 9 cm (3 1/2 inches) in length to the tip of the nose, by 5 cm (two inches) tall to the shoulder. The top of the head is roughly 1 cm (1/2 inch) higher than the shoulders. This would make a sheep three 1/2 feet long by just over two feet tall at the shoulder, which means the model is in roughly 1:12 scale. To make my sheep in 1:24 scale, I have to reduce the size of the model by 1/2. When you are determining scale, know at least one of the measurements of your object in real size (length, width or height). That way you can compare the real measurement to your model, and adjust all the measurements to the correct size for a particular scale. When you measure a photo or a model to get proportions and size, measure the main body parts (the body of the sheep) as a block from the base of the feet to the shoulder. Measure what portion of that body block is legs, and what portion is body. Compare the length of the head to the end of the nose, with the length of the body. Is the body three head lengths, more, less? When you know the length of the sheep's body, the length of its legs, and the ration between the length of the head and the length of the body, you can start to work on your scale miniature sheep. First draw a rough block diagram for your sheep's body. My diagram was a rectangle 4.5 cm by 2.5 cm high. This is for a 1:24 scale sheep. I marked the rectangle lengthwise at the 1/3 mark, as the head is roughly 1/3 the length of the total body from the tail to the end of the sheep's nose. As the sheep's head sits higher than its shoulders (which were marked by my rectangle), I added a 1cm box on top of the rectangle above the third where the sheep's head would be. The sheeps head fits at the top of that extra rectangle, and the sheep's nose is at the 4.5 cm length on the larger rectangle, just at the height of the legs. The body of the sheep is a bit more than half the height of the total rectangle. The body is slightly taller than the legs below the body. With your miniature sheep body frame secured, take loose roving fiber, it usually comes wrapped in loose 'bats' and roll it into a loose yarn, roughly the size of string. You will need thinner groups of fibers for smaller scales of miniature sheep. Wrap your fiber down the length of a leg as a straight section, and over the end of the foot. Wrap the fiber back around the frame and the straight length of fiber, until you reach the top of the leg, but don't wrap it too tight, you want one fairly thin layer. Now start to work your felting needle through the fibers covering the leg of your sheep. Keep turning the sheep over on your work surface to keep your leg round. You want the bottom of your legs to be a bit smaller than the diameter of the pipe cleaner you started with, and evenly covered with fiber. When you have finished a leg, take the fiber down the opposite leg and over the end of the foot, then wrap the fiber around the leg back up to the body. Felt the other leg. See the instructions for the miniature raccoon or the miniature dog (linked to page one of this tutorial) if you need more photos. When you have finished the legs, wrap the body and the head loosely with a small amount of fiber to cover the pipe cleaner frame and felt it in place. Your miniature sheep won't look like a sheep at all, but it should look similar to the wrapped pipe cleaner body frame in the photo above! with the first layer of fiber felted into place, bend your frame into a rough sheep shape and lay it over your diagram to check for size and proportion. Work your felting needle carefully through the bottom part of the legs, below where the sheep's body will be, making the ends of the legs as even and as thin as possible. Although I won't show this step again in these instructions, you should check your progress often against your diagram, to make sure your sheep body is staying to the correct proportions. Make sure the end of your pipe cleaner at the sheep's nose is completely covered with fiber and work it tight to the pipe cleaner or wire at the muzzle or nose end. The sheep's head is a rough triangle (see photos next page) so wrap the back half of the head with extra fiber and needle felt it to a triangle to form the top of the sheep's head and the neck. These photos of a ram and a lamb plastic model sheep show you some of the detailing you may want to include to make your sheep's head the correct shape. Remember that to make something thinner, you felt more into that area. To mark the line between the sheep's forehead and eyes and its nose, you can make a strong line of needle felting at that join mark. If your sheep's muzzle grows too long and thin, needle felt back through the end of the sheep's nose to shorten it. It is always easiest to have a picture in front of you for reference when you are trying to shape something. Sheep bodies are supposed to look like a box with legs. 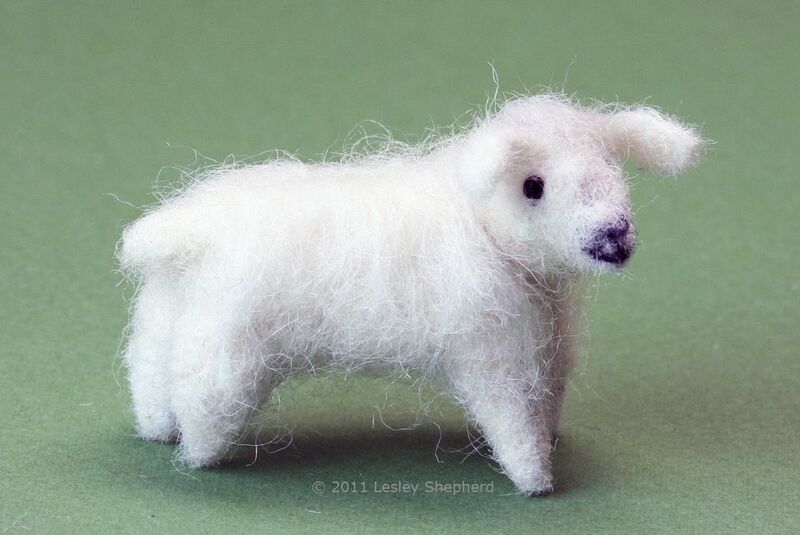 To build your miniature needle felted sheep out to shape, wrap a layer of fiber loosely around the body and secure it in place by running your needle along the center line of the body on the stomach side. (see photo). Remember that you can always bend your sheep body flat to work on it easier. When you have the fibers secured to the stomach arean, stretch some of the fiber out over the tops of the legs, and run your needle halfway up the leg to secure the fibre roughly at the height of the knee on the sheep. Don't worry about needle felting over the entire body. You want the sheep to be slightly 'puffy'. Pull a bit of the body fiber to the back of your sheep and needle felt through it to make a small tail. Keep folding the section, then felting it, then folding in the loose fibers until you have a small tail you can felt around. Keep felting the tail until it is firm, and wider than it is thick. Leave for now, you can trim it to shape later. Like all the rest of the needle felted areas, if your tail is too long, too round, too short, you can make a flat 'patch' of fiber on your needle felting mat, than attach the extra fiber and work it to shape. Or you can remove parts which are too thick by trimming them with scissors and adding in a new part. Needle felting is very easy to modify or 'fix'. Make the ears for your miniature felted sheep by rolling a small roll of fibers and felting them together on your mat or felting surface. Make sure the ear material is flat and not too thick, and has loose fibers on one end. You will use these loose fibers to attach the ear. When you have felted enough fiber for an ear, use sharp scissors to trim it roughly to shape. When you have made both ears and trimmed them roughly to shape (except for the loose fibers on the end close to the head), use your felting needle to attach the ears to the top of the miniature sheep's head. See your reference photos for the correct position. Different breeds of sheep have differently shaped ears. Sheep use their ears a lot, and the position of the ear often tells you what the sheep is doing. If you want your sheep to be watching some activity, make sure their ears set up a bit. If you want them to appear angry, flatten their ears to their heads. To make the mouth and nostril lines on the muzzle of your miniature felted sheep, first make sure your face is the correct shape. Work the muzzle until it is fairly compact and smooth. Make sure the eye and forehead area show a separation from the muzzle area. Check the photos of the model sheep for details. When you have the muzzle area the way you want it, roll a thin line of dark or black fiber or embroidery thread to mark the muzzle and nostrils. If you find this difficult to do (fine needles work best), you can use an indelible fine point artist's pen to mark these lines instead. Begin by marking the mouth lines. Start felting a line of thread onto the side of the muzzle where the mouth would open. Leave a bit of extra thread free behind the back of the mouth, you can cut that off when you have your thread line anchored securely. Work carefully with your needle directly through your dark thread. Try not to push the needle all the way through the sheep's face. If you do, the black lines will start to come out on the other side of the muzzle, which isn't a disaster, but makes the detail lines more difficult to see. Work the line of the mouth securely into the muzzle right around the end of the sheep's nose. Trim off any extra ends of thread and work the cut ends into the sheep's muzzle. To mark the nostril lines you will make a "Y" shape. (see the reference photos). Anchor your line of thread by working through it with the needle, starting at one nostril and working down the leg of the "Y" to where it joins the mouth. Trim your thread ends once it is anchored securely. Work the final arm of the "Y", then use sharp scissors to trim your muzzle to its final shape. Trimming the fibers around the muzzle tight to the felted shape of the muzzle. Use a fine felting needle to continue to sculpt the shape of your miniature sheep's head until you are satisfied. Make sure your muzzle is the correct length, or push it back into the face by using your needle on the end of the nose, anchoring it into the center of the head. Check that the head widens and goes up at the point where you want to set the eyes. When you have finished shaping the miniature sheep's head, use sharp scissors to trim the fibers close to the felted surface. Sheep usually don't have wooly faces. Use your felting needle to add some shape to the top of the sheep's legs where they join the hips and the shoulder. Wherever you work your needle, you will 'draw' lines by compressing the fibers. If you want a longer 'coat' on your sheep, use your needle to attach a section of fiber over the sheep's back, by running your needle in a line along the sheep's spine, over the fibers. Attach these loose fibers to the sheep's legs at the knee. Trim the fibers to follow the lines you want for your sheep's coat. When you have the sheep's coat trimmed to length, Use your scissors to trim the lower sections of the leg very close to the needle felting. You want your sheep to have legs which are as thin as possible. Decide on which method you will use to add eyes to your poseable miniature sheep. I used wired glass teddy bear eyes. You can also needle felt small balls of black fiber on for eyes (safest if the sheep will be anywhere near small children), or you can sew on small black beads. To add glass teddy bear eyes on wire shafts. Cut the wire on the shaft in the center if two eyes are connected. Insert the eye through the head of the sheep at an angle, so the eye wire comes out at the back of the neck as shown. Press the eye tightly while you trim the wire 1/4 inch out from where it protrudes through the sheep's neck. Bend the end of the wire back on itself, and release pressure on the eye. The wire should pull back into the fibers at the sheep's neck. Repeat with the other eye. If you can see the ends of the wires on the sheep's neck, make a small fiber patch by felting some fiber to match the sheep's coat, and felt it in place over the eye wires. To finsih the sheep's head, add a small patch of loose fiber over the top of the sheep's head between the ears, letting some loose fiber hang over the sheep's forehead. Felt the fiber in place up to the area between the ears. Trim the fiber over the sheep's forehead to form a small 'top knot'. As your sheep has a wire frame beneath the felted fiber, you can pose the legs, and the head and neck at different angles. Choose poses that look natural, but which suit your particular sheep. Sheep can also be posed laying down, or kneeling. Young lambs can be posed with straight legs in a 'spring' posiion with their backs slightly arched. You can also adjust the position of their ears by gently twisting them into a more standing or laying down position to change the expression on your sheep.